I've recently been trying to self-diagnose sleep apnea on myself and I recorded my oximeter readings while I was asleep. The results are good but confusing to me. I see no drops below 90% Spo2 however I see multiple spikes where my heart rate goes into the high 90's. Is this normal? Anyone know what this may mean? I was thinking it could be that my heart was pumping blood faster to compensate for a drop in oxygen but I'm not sure as I read that dreaming could also cause spikes in heart rates. Hi deeq92 - Welcome to the forum! Those spikes are known as artifacts. They can be caused by simple things like bumping the probe, turning over, or rapid hand movement. Look at the overall trend and not the individual points. Yours looks fine. actually the HR usually does not accelerate during REM sleep. your HR spikes are not at the end of the oxygen desaturation, but more often prior to admittedly small desaturations. 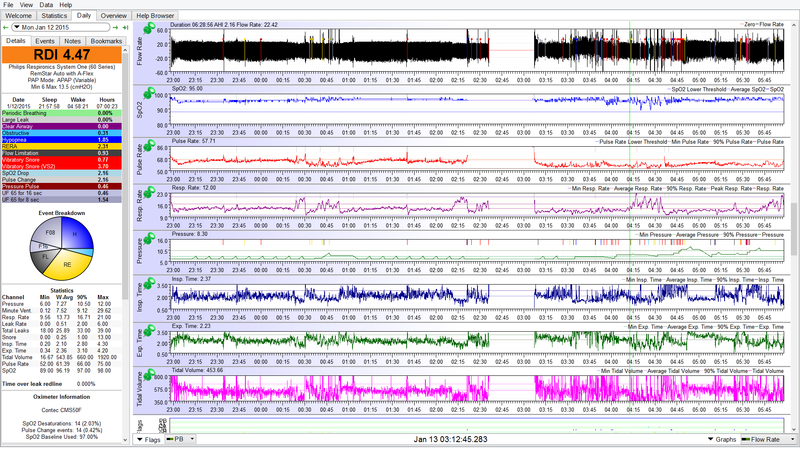 those spikes do tend to indicate your were alerted probably to an awake state. as stated above, it might be an artifact of the sensor. In my experience a zero result is more likely for an artifact, so going high like that is not what I would have expected. what caused you to consider that you might have sleep apnea? I too think the spikes are a glitch, There are 2 that have a bit of width and go to 85 that I think are legit, but that is normal for me to get a 20-30BPM swing through the night. A good dream gets our heart rate moving. As you know your o2 is well within normal and I would be very happy with that result. When I got my sleep study the oximeter lead they used is solidly taped to your finger and can't move. The home use ones are reusable so get knocked around. odd spikes here and there. I had my home oximeter before getting my sleep test and the average numbers and general patterns were similar to my sleep study but it did have several wildly swinging lows not reflected in the sleep study numbers. My opinion would be they are just not good numbers. (06-16-2017, 04:37 PM)quiescence at last Wrote: actually the HR usually does not accelerate during REM sleep. Well I usually have a really hard time getting up in the morning and am tired throughout the day despite sleeping 8 hours so I thought sleep apnea might be a possible cause. I'm debating whether to get a sleep test done as these results seem to indicate things are fine. (06-16-2017, 05:11 PM)ajack Wrote: I too think the spikes are a glitch, There are 2 that have a bit of width and go to 85 that I think are legit, but that is normal for me to get a 20-30BPM swing through the night. A good dream gets our heart rate moving. Yeah I figured it might be a dream or something that got my heart rate up. I guess i'll try the experiment a couple more times and see if anything changes. (06-16-2017, 04:31 PM)Crimson Nape Wrote: Hi deeq92 - Welcome to the forum! Good luck to you and hang in there for more responses to your post. Lack of low SP02 levels do not indicate that you don't have sleep apnea. It just means that your events are not long lasting. Lots of frequent, short events can be equally disruptive to your sleep. Get the test. I thought I would have to correct my statement about not getting increased HR during REM and/or dreaming, because there are a lot of publications stating so. But, below is very normal response showing lowering during REM sleep. Interesting enough, the timeframe starting at 4:15 in REM sleep with abrupt desaturations, but no HR increase you would normally expect in distress arousal that ought to be happening to fix my O2 level. I'll look for another timeframe where I know I had nightmares to confirm heightened HR at that time.